This is part four in a series on the topic, “New Testament Principles on Leadership Structure.” Enjoy. If you want to catch up on the previous parts, scroll down. This is a faithful saying: If a man desires the position of a bishop, he desires a good work. 2 A bishop then must be blameless, the husband of one wife, temperate, sober-minded, of good behavior, hospitable, able to teach; 3 not given to wine, not violent, not greedy for money, but gentle, not quarrelsome, not covetous; 4 one who rules his own house well, having his children in submission with all reverence 5 (for if a man does not know how to rule his own house, how will he take care of the church of God? ); 6 not a novice, lest being puffed up with pride he fall into the same condemnation as the devil. 7 Moreover he must have a good testimony among those who are outside, lest he fall into reproach and the snare of the devil (1 Timothy 3:1-7). For this reason I left you in Crete, that you should set in order the things that are lacking, and appoint elders in every city as I commanded you– 6 if a man is blameless, the husband of one wife, having faithful children not accused of dissipation or insubordination. 7 For a bishop must be blameless, as a steward of God, not self-willed, not quick-tempered, not given to wine, not violent, not greedy for money, 8 but hospitable, a lover of what is good, sober-minded, just, holy, self-controlled (Titus 1:5-8). The elders who are among you I exhort, I who am a fellow elder and a witness of the sufferings of Christ, and also a partaker of the glory that will be revealed: 2 Shepherd the flock of God which is among you, serving as overseers, not by compulsion but willingly, not for dishonest gain but eagerly; 3 nor as being lords over those entrusted to you, but being examples to the flock (1 Peter 5:1-3). The overriding concern of the New Testament in relation to church leadership is for the right kind of men to serve as elders and deacons. The offices of God’s church are not honorary positions bestowed on individuals who have attended church faithfully or who are senior in years…The church offices, both eldership and deaconship, are open to all who meet apostolic, biblical requirements. The New Testament is unequivocally emphatic on this point” (ibid, p. 68). Paul insists that the leadership under Timothy’s care not only be of the utmost in character qualities (see 1 Timothy 3:1-7 above), but also that the leaders must “…first be tested, then let them serve…” (1 Timothy 3:10). This indicates that the qualifications for an elder must be clearly observed in the person before they are selected for leadership. This was not just a set of qualifications to be used in interviewing a potential candidate, but rather was an observable lifestyle noticed by the other elders. Elders who govern the church well are men who have access into the lives of her people. They enter homes, love the hurting, counsel marriages, and pray for those in distress. They are men who are aware of confidential information that will affect the lives of those of whom they have relationship. These governing elders are leaders who teach God’s Word and model the life they teach. Such men must have irreproachable character because of the ministry responsibility they carry. In addition, church leaders are to be examples to the flock (see 1 Peter 5:3 above). Their beliefs and lifestyle are to be models of conduct that everyone in the fellowship would want to emulate. John MacArthur writes, “Whatever the leaders are, the people become. As Hosea said, ‘Like people, like Priest’ (4:9). Jesus said, ‘Everyone, after he has been fully trained will be like his teacher’ (Luke 6:40). Biblical history demonstrates that people will seldom rise above the spiritual level of their leadership” (ibid, p. 70). Leaders have a tremendous responsibility in leading the church well. They will be followed and even copied in how they talk, how they react, and how they live. These are the spiritual fathers of the church. Their lives will be seen as examples to the flock. If the elders have a contentious spirit, the people will become contentious (see 1 Timothy 3:3; Titus 1:7). If the elders are greedy, the people will become greedy (see 1 Timothy 3:3). If leadership is allowing immorality, the entire church will be negatively impacted by immorality. Stauch writes, “Much of the weakness and waywardness of our churches today is due directly to our failure to require that church shepherds meet God’s standards for office. If we want our churches to be spiritually fit, then we must require our shepherds to be spiritually fit” (ibid, p. 71). Above reproach (1 Timothy 3:2-7; Titus 1:6-9): anepilemptos, meaning free from any offensive or disgraceful blight of character or conduct, particularly as noted in verses 2-7. The husband of one wife (1 Timothy 3:2-7; Titus 1:6-9): mias gynaikos andra, meaning a “one woman man,” one who, if married, has a faithful, healthy monogamous marriage to one woman. This would prohibit any questionable sexual relationships related to polygamy, homosexuality, concubines, or outside relationships other than one’s wife. This passage is not excluding a single man, but rather defining the relationship of one who is married. Temperate (1 Timothy 3:2-7): nephalios, meaning mental sobriety, self controlled, and free from debilitating excesses or rash judgment. Prudent (1 Timothy 3:2-7): sophron, meaning self controlled with good judgment and able to keep a balanced, objective perspective in the face of disagreements and problems. Respectable (1 Timothy 3:2-7): kosmios, meaning a sensible minded person with proper behavior and orderliness. Hospitable (1 Timothy 3:2-7; Titus 1:6-9): A concrete expression of Christian love in the church and in one’s family. An open home to those in need. Able to teach (1 Timothy 3:2-7): Able to guide and protect the body through the proper handling of Scripture. A readiness to teach when needed and an aptitude in basic theology and doctrine. Not addicted to wine (1 Timothy 3:2-7; Titus 1:6-9): Above reproach in the use of alcohol; not preoccupied with or overindulgent in the use of alcohol. Not pugnacious (1 Timothy 3:2-7; Titus 1:6-9): A pugnacious man is mean spirited, bad tempered, and out-of-control with one’s attitudes and actions. One who is prone to gossip, anger, and highly emotional. 10. Gentle (1 Timothy 3:2-7): Meaning forbearing, kind, magnanimous, equitable and gracious. 11. Uncontentious (1 Timothy 3:2-7): Meaning peaceable and not divisive in word or deed. 12. Free from the love of money [sordid gain] (1 Timothy 3:2-7; Titus 1:6-9; 1 Peter 5:1-3): meaning not greedy but content. 13. Manages his own household well [children who believe] (1 Timothy 3:2-7; Titus 1:6-9): Meaning he can manage (prohistemi) lead and care for his wife and children in a responsible manner. He must have a reputation for caring for and managing his family financially, emotionally, and spiritually. A man who can manage his children graciously and consistently. 14. Not a new convert (1 Timothy 3:2-7): Meaning not new to the faith, not a beginner or a baby Christian. 15. A good reputation with those outside the church (1 Timothy 3:2-7): Meaning that the person is known for integrity, honesty, and fair dealing in the secular world. 16. Not self willed (Titus 1:1-9): Self willed means arrogant, prideful; the opposite of being gentle. A self-willed man is stubborn and insensitive to the opinions and needs of others; he is headstrong, independent, self assertive and not a team player. 17. Not quick tempered (Titus 1:1-9): Quick tempered means a “hot head,” an angry person who is easily antagonized and hurt. A destroyer of peace and unity. 18. Lover of what is good (Titus 1:1-9): Closely associated with hospitality, the word is philagathos, meaning one who willingly, and with self denial, does good and is kind. 19. Sensible (Titus 1:1-9): sophron, same as prudent. 20. Devout (Titus 1:1-9): hosios, meaning firmly committed to God and His Word; to be separated unto God and His purposes. 21. Self controlled (Titus 1:1-9): Meaning self disciplined in every aspect of life, particularly in physical desires. 22. Holds fast the faithful Word (Titus 1:1-9): Able to exhort in sound doctrine and refute those who distort and contradict God’s Word. 23. Not under compulsion, but voluntarily (1 Peter 5:1-3): Meaning one who willingly and joyfully gives of his time to help and minister to others. 24. Not lording over, but proving to be an example (1 Peter 5:1-3): Humble, not dictatorial, but a mentor to those in need. 25. Shepherd of the flock of God (1 Peter 5:1): poimanate, meaning to tend, to know the flock, seek out the lost, gather the flock, and feed the lambs. We might call these “The Top 25 Leadership Qualifications of the New Testament.” This is perhaps the most thorough list ever written on leadership qualifications. From this list we see the ethical, moral, and spiritual qualifications needed for leadership in the local church. Without questions, if churches today took seriously the qualifications listed in the New Testament for all elder positions, our churches would be as empowered as the New Testament churches were. This is part three in a series on the topic, “New Testament Principles on Leadership Structure.” Enjoy. If you want to catch up on the previous parts, scroll down. Although elders act jointly as a council and share equal authority and responsibility for the leadership of the church, all are not equal in their giftedness, biblical knowledge, leadership ability, experience, or dedication. Therefore, those among the elders who are particularly gifted leaders and/or teachers will naturally stand out among the other elders as leaders and teachers within the leadership body. This is what the Romans called primus inter pares, meaning “first among equals” (ibid, p. 45). Even Jesus singled out Peter, James, and John as “first among equals” in relation to the other twelve disciples (see Luke 8:51; 9:28; Mark 14:23). In all four gospel accounts, Peter is the prominent leader among the twelve disciples. Peter also stands shoulders above the other leaders in the Jerusalem church (see Acts 2:14, 42; 4:33, 35; 5:12, 18, 29, 42; 6:2-6; 8:14; 9:27; 15:2-29). Peter is the chief leader among the elders in Jerusalem in the first twelve chapters of Acts. In the second half of Acts, beginning in chapter thirteen, Paul becomes the dominant leader among the apostles outside of Jerusalem. In Paul’s letter to the Galatians he speaks of James, Peter, and John as the “pillars” of the church in Jerusalem (see Galatians 2:7-9). We further advance this principle of “first among equals” as we see who the pastoral epistles (1st and 2nd Timothy and Titus) are written to. Paul directs his two letters to Timothy, and not the elders in Ephesus. Paul sends his letter to Titus and not to the elders at Crete. Indeed, with Timothy and Titus are both taxed with the responsibility to “set in order the things that are lacking” and develop strong leadership in each church. The pastoral epistles describe men who are the “first among equals” in building solid structure in teaching, church discipline, leadership qualifications, and church government. The level of authority and the kind of teaching that Paul brings to these men make it obvious that they are to follow just what Paul admonishes Timothy, “And the things that you have heard from me among many witnesses, commit these to faithful men who will be able to teach others also” (2 Timothy 2:2). Thus, Timothy in Ephesus and Titus in Crete are acting in the capacity of being lead pastors over the governing leaders in each congregation. Accordingly, scripture shows that the main vision, values, and direction of the Jerusalem church came from Peter (see Acts 1-13), and that the main visionary of the churches outside of Jerusalem rested largely with Paul (see Acts 14-28). The lead pastor in Ephesus at the time of Paul’s letter was Timothy. The lead pastor in Crete was Titus. Thus, the principle of “first among equals” is another strong principle of New Testament government. The senior pastor would be one among the elders in this system. He does not have authority over them, nor does he work for them as an employee. He has a somewhat distinct role in that he is engaged in the full time work of ‘preaching and teaching,’ (1 Tim. 5:17), and derives part or all of his income from that work (1 Tim 5:18). 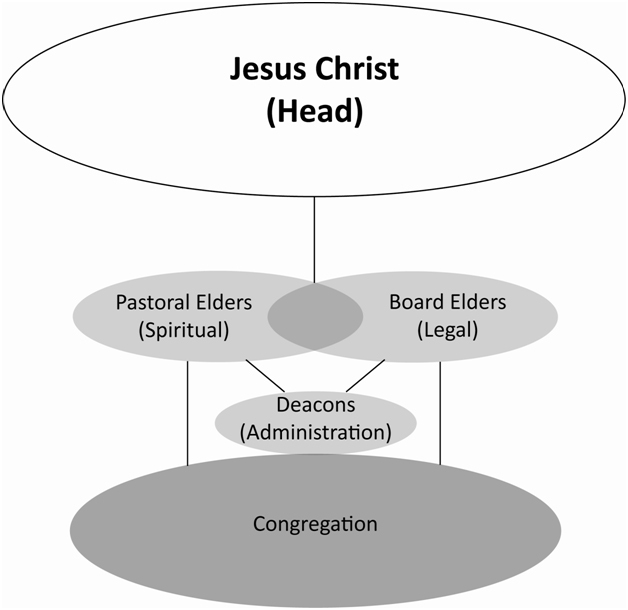 He also may frequently assume a leadership role (such as chairman) among the elders, which would fit with his leadership role among the congregation…Such a system would allow a pastor to exercise strong leadership in the church while still having equal authority with the other elders” (p. 933). Hence, the New Testament is very clear that God raises up men with a certain gifting of leadership and teaching that is used by God to build up and guide the local church toward the vision God has given that body of believers. They are not more special or more gifted but do occupy a position of greater responsibility to the Lord and the elders in leading the church. As the senior pastor and founding pastor at MSC, I am often considered the “first among equals” at Elder Board meetings. I am equal and not above the other elders in all matters related to the board. But because my role involves visionary leading and teaching God’s Word, God has given me a certain responsibility and equity with my spiritual and board elders that requires that I lead out on visionary matters. In some church structures, I would be designated as the “teaching elder.” MSC also has an executive pastor who is a “first among equals” with the other pastors as he leads them in the day to day ministry of the church. How and by Whom are Decisions Made at MSC? The Autocratic mode of decision making means that one man leads and makes all major decisions. At MSC, we rarely use this approach. Yet there are times when myself, or one of our other lead pastors or board elders, must make a decision quickly and singularly. Even in those situations, we encourage that consultation be sought first. The Consultative mode of decision making means that a leader consults, gets the opinion of others and from that consultation makes a decision with the group largely in agreement. I prefer this model more than the Autocratic and find that this is often an excellent approach. We have, from time to time, had to make major decisions that will impact the whole church, and I have always followed the consultive and also the following, consensus model. The Consensus mode of decision making means that the group agrees in unison on a given approach or decision. This is my preferred approach to leading and managing MSC. Almost all decisions made by the pastors and board fall into this category. The Democratic mode of decision making means that votes are cast and the majority wins. Although this is the approach used in many churches, I have rarely used this, as it has the potential to short circuit the deep prayer and consensus building needed to develop a solid team that hears God together. However, at the point of a deadlock, this approach can be preferable. On the Pastoral and Board Elder Teams we approach each issue and decision with what I refer to as the “75/100 Rule.” This means that we will always seek 75% agreement on a decision, but 100% support once the decision is made. After much dialogue, once a decision is made, even if there is not complete unanimity on the decision, when we walk out of the meeting, we will support the decision 100% in talking about or discussing it with the congregation. This enables us to keep unity in the body, even when we disagree on certain matters.